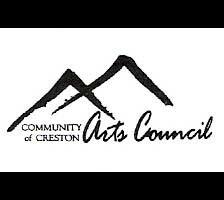 The Community Arts Council of Creston plays the role as an umbrella organization for arts and culture. We support groups, individuals and organizations engaged in arts related activities. â��Artsâ�� means all the arts; visual, performing, literary, media, culture and heritage. New members are always welcome. Membership is open to any individual, group, organization or business that is supportive of or engaged in arts and culture. Membership fees help us to carry out our mandate of encouraging and supporting the arts in the area from Yahk to Riondel. Memberships are renewable annually after our Annual General Meeting in September and are available anytime. Membership forms can be picked up at the Creston Public Library, Park Studio Gallery, or at the monthly Arts Council meetings held on the second Wednesday of the month (Sept thru June) at the Snoring Sasquatch Hostel, 221 11th Ave N. Creston, BC at 7pm.